Above L: Heidi's beginner class. Above R: DezsÅ‘ and Brenda talking with Eszter. With winter comes sickness in this small town. Because of various viruses and the flu, many of our students were absent. We were thankful that nearly all the students who were present, stayed for our second hour of Bible study. We heard Jesus' parable of the lost sheep and discussed Jesus' mission and response to those who repent. These students are hearing the gospel every week and we hope that they will respond by putting their trust in Jesus as their Lord and Savior. We only have a few more classes left before we end this year's semester. Please pray that the seeds that have been planted would settle deep in their hearts and grow according to God's grace. 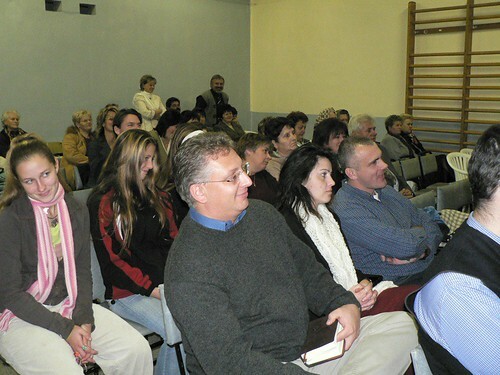 Above: Students that stayed for the Bible study L to R: Hugi, Eszter, Monika, Szandi, Dávid and Attila. 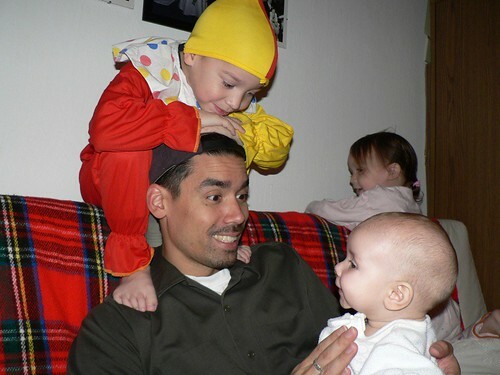 Above: Coming home to my three beautiful clowns. Above: Sharon took Kira to the doctor today for a general check-up. 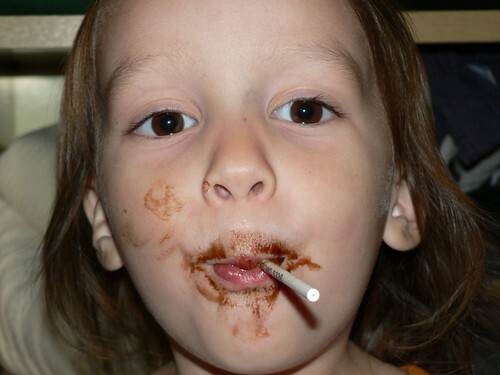 Kira has been sick for a few weeks with congestion and coughing. The doctor said that it could be bronchitis or a virus. We are 'waiting it out' to see if she gets better soon. 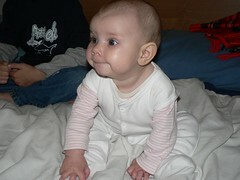 Other than the sickness, Kira is in great shape and is a treasure to see when she giggles. Please pray for her healing and mine (Allen) as well. DezsÅ‘ and I spent the morning talking about aspects of the Christian life. We talked about testing, stewardship and the limited time we have on this earth. 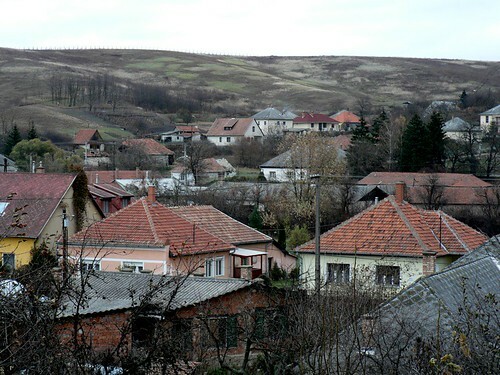 DezsÅ‘ has been in the midst of a test for some time and is growing in his faith and character. Just this past week, he had conversations with two of his employees about God. After the conversations, one of them said to him, "Is there a bus that goes to PetÅ‘fibánya from here?" She wants to visit our church and lives in the town where DezsÅ‘'s factory is located. The other said, "Where do you go to church," expressing his interest in coming. Please pray for DezsÅ‘ as he returns to work tomorrow and has more opportunity to share the gospel with workers. 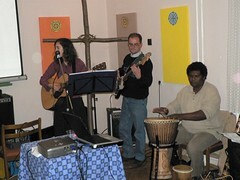 Tonight, (sorry no pictures) Hugi and her husband Gábor came to our worship service. This was Gábor's first time stepping foot in any church service (what a privelage for us!). For those of you who have been praying for Hugi's husband Gábor, God is answering in a big way! I had a chance to speak to him after service and he openly shared where he was in regards to faith. 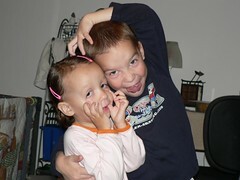 Gábor said, "Honestly, my family thought making money was the most important thing in life. They never talked about God. I left home when I was 18 and since that time have sought to provide for myself. I've made some bad decisions in my past along with the good ones. I now understand that I need to change, but I'm not sure how to change. Now I am open to reading the Bible and seeking." I spent some time explaining the basics of the Bible (he was holding Hugi's Bible in his hand). Please pray that he will begin reading this week and begin understanding God's truth by His grace. 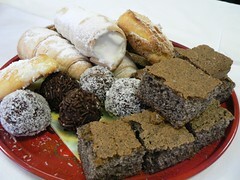 We have invited Hugi and Gábor to dinner this Friday. We look forward to getting to know them better. We also celebrated Miki and Heidi's birthday. We are thankful to be working alongside of them and we are greatful for them as friends in our lives. 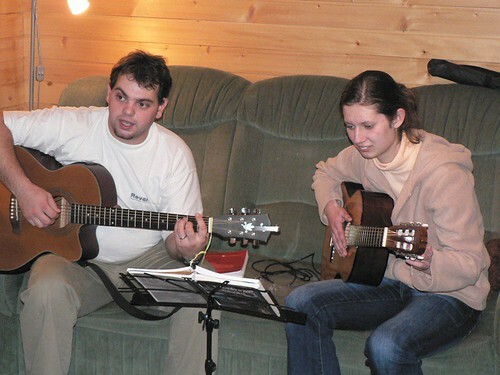 Above: Miki giving Eszter some tips on playing guitar. 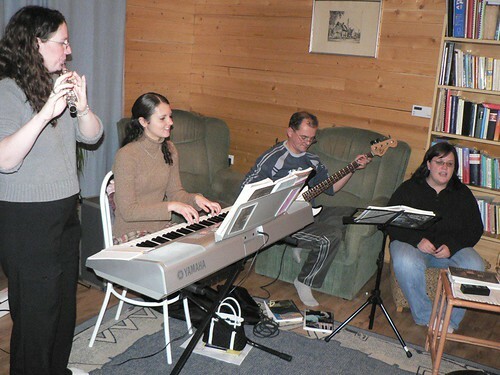 A few weeks ago, DezsÅ‘ invited Eszter to our weekly worship practice. Eszter is one of Brenda's students and Brenda has had opportunity to develop a relationship with her and her sister Monika (also a student). She told Brenda that she enjoyed the time with us and hopefully she will continue to come to our worship practice. On Thursday, we celebrated thanksgiving in Budapest with the entire team. 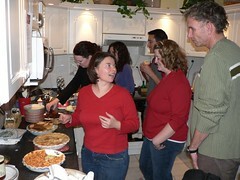 Above: It was a blessing to be together (and it didn't hurt to have a delicious turkey dinner. 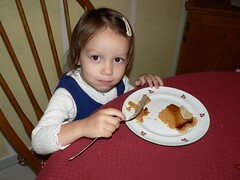 Elianna dug into her pumkin pie with great joy! 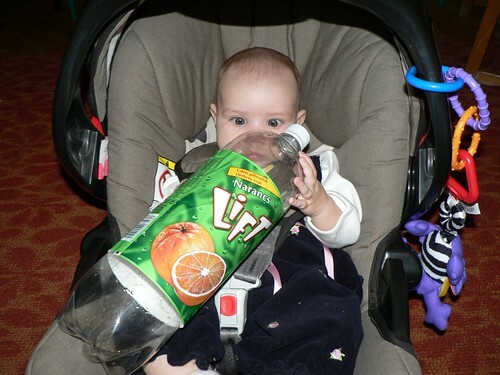 Above: 'Grandma Karen' visits our family on Friday bearing gifts. Above: Eighteen teens came to our Friday night sports outreach. I mentioned a few weeks ago that our devotion time that we hold at the break in between halves, was full of distractions. We decided to change the format of our night to allow for a devotion for only those who were interested. We ended up playing for an hour and a half, leaving the last twenty minutes to study the Bible. We allowed those who were not interested to pack up and exit the building. I was thankful that eight out of the eitghteen stayed for the short Bible study. 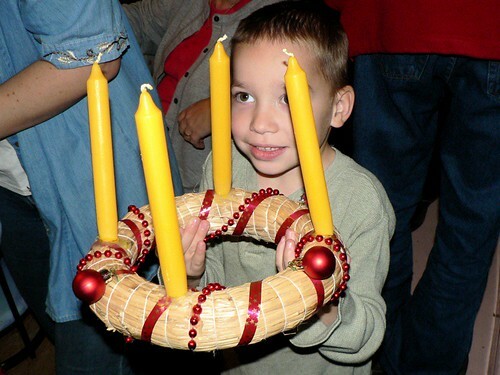 Above: On Saturday night, we held an Advent wreath outreach in the neighborng town of Selyp. 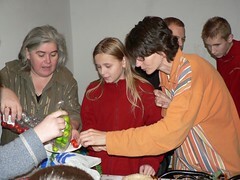 Above L: Julika (far left) helping Niki and Hugi. Julika started the night by explaining the symbolism in the advent wreath and turning our attention to Jesus Christ. 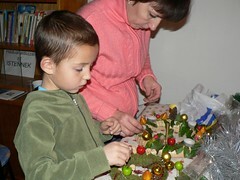 Above R: Gabi S. and Gabi K. teamed up to make an advent wreath for our church. Gabi K.'s sister is Niki (above L). 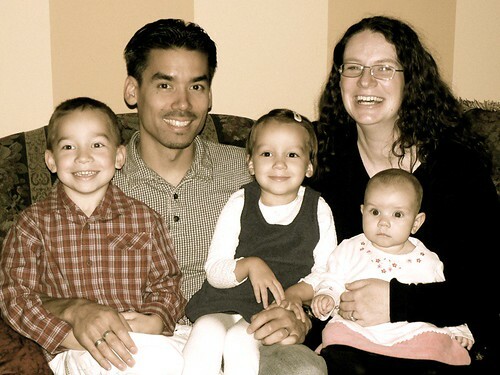 Years ago, both Gabi and Niki attended children's bible studies that Miki and Erika held. Now (years later), we are reconnecting with them and hope to continue directing them to grow in their faith in Jesus Christ. 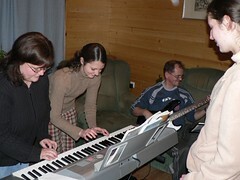 Above: Anita with her family. Anita who lives in Selyp helped us in our VBS this year. She has been helpful in inviting others to the Bible study that Miki hold in Selyp. Above L: Andi with her son Milán. Andi, who is a regular attender of our church was asked in a small group setting why she chose to attend. She said, "Since I have been coming here, I sense that God speaks to me." Praise Him! 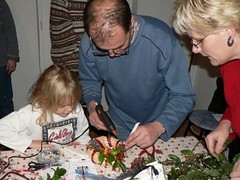 Above R: DezsÅ‘ helping his daughter put the finishing touches on their advent wreath. 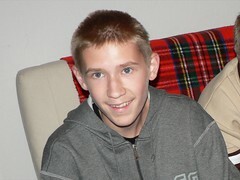 DezsÅ‘ has committed to helping Miki in his initial steps into Selyp. This is a type of 'hands on' mentoring. Above L: Pastor Feri with DezsÅ‘. Feri is the pastor of the Baptist church in Selyp. He allowed us to use his church facility for this outreach and we are continuing to seek ways in which we can work together to reach Selyp and LÅ‘rinci which has double the population of PetÅ‘fibánya. 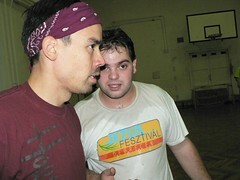 Above R: Miki building new relationships in the community. The man speaking with Miki is the husband of one of Ben's preschool teachers (hope you could follow that connection). He will be meeting with us tomorrow discussing ways in which we may partner in a children's camp next summer. Please pray for this meeting. We do not know if he is a believer in Jesus Christ. Above: Benjamin presenting his work of art (with a little help from mom). It is easier to be overwhelmed by tragedy and suffering than to be overwhelmed with thanksgiving. It is no secret that we are living in a world where there doesn't seem to be much to be thankful for. Holidays are often coupled with depression and anxiety. These are all symptoms of a misplaced treasure. Christians are not exempt from the tragedy and suffering of this world. It seems as if we sometimes suffer more than those who are clearly opposed to God. Can we be thankful this thanksgiving? We can, if we are holding on to the right treasure. Why can we, as Christians, be thankful in the midst of suffering and tragedy? Because, our thanks arises from being redeemed in the past, present and future. In the past, in His mysterious love, the Father sent His Son Jesus to die on our behalf. In the present His risen Son Jesus promises to be with us through every experience of life. In the future, we will be with Jesus in eternity which will be "an eternal weight of glory far beyond all comparison". Our hope does not end in this world. What is presently "seen" is not always so pretty. But the eternal, "what cannot be seen", is guaranteed to make all suffering and tragedy in this age "light" in comparison. Our treasure is in Jesus Christ who has given us forgiveness of sins and eternal life. Our thanks has redemption as the source and the Redeemer Jesus Christ as the object. Yes, we can be very thankful! For those of you who follow our blog-sorry for the recent delay in news. I (Allen) was away at a leadership conference from Friday to Monday, and will now try to broadly fill in the gaps of the last few days. Above: Last Thursday night's discipleship meeting with teenagers Gabi K (far left), Gabi S. and Zoli. I am very thankful for the teenagers growth as we continue to study the foundations of our faith in Jesus. Gabi K. shared how thankful he was for the opportunity to learn God's word in this small group since he is not allowed to attend our church on Sunday. Please pray that his father's heart would be softened toward the gospel and that God would draw Gabi's entire family to Himself. 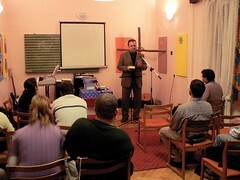 At the same time, across town, Miki hosted his small group where DezsÅ‘ facilitated the study for the first time. 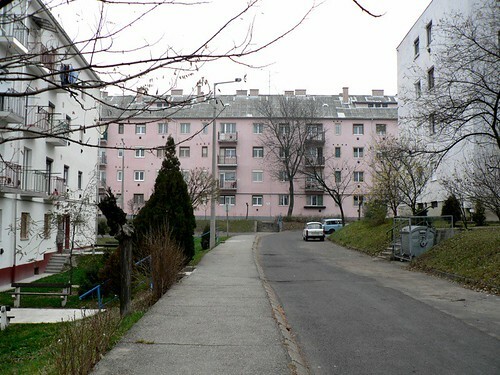 Above: A view of our pink apartment and the sidewalk that Sharon uses to walk Ben and Elianna to pre-school. It was definitely more challenging with Allen gone (with the car) for 3 days, leaving Sharon with 3 kids! I'm so thankful for her sacrifice. Our teammate Brenda was gracious enough to help Sharon in various ways throughout the weekend. 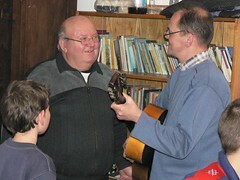 Above: On Sunday, both Miki and Allen were out of town, and we entrusted DezsÅ‘ to facilitate worship service. 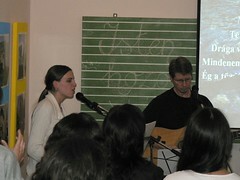 The Pioneers Area Resource Team led musical worship and Dave Hall taught on how God lifts us out of the miry clay. DezsÅ‘, Csaba and Hugi told me in English class tonight how thankful they were for last night's service. Above: Ibolya (above L), a first time visitor was invited by Laci (above center) to our service. She was so thankful to find us and may return next week. Above: My English students getting ready for an interview/answer session. 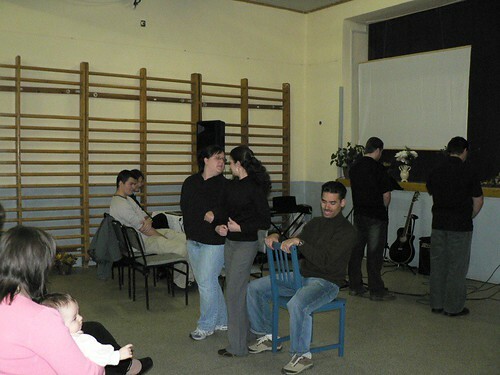 Hugi's husband Gábor (above R blue shirt) has chosen to join my intermediate class. After our first hour, I was curious to see if Gábor would stay for the Bible study. Last week, he was quick to leave, while Hugi remained. Gábor did stay and also openly participated in the discussion time. One of the questions he answered gave us some insight into his commitment to his wife Hugi. I asked the group, "Have you ever had to leave something valuable behind in order to pursue something of greater value?" He shared with us how he sold his home and left his workplace in Budapest to support his wife Hugi when she became sick. Tonights study was about the rich young ruler who approached Jesus and asked what good thing he needed to do to gain eternal life. At the end of the study, I communicated the question that should have been asked: Jesus what do you need to do in order that I gain eternal life. Praise Jesus for His finished work on the cross, and the inheritance of eternal life to all those who believe in Him. 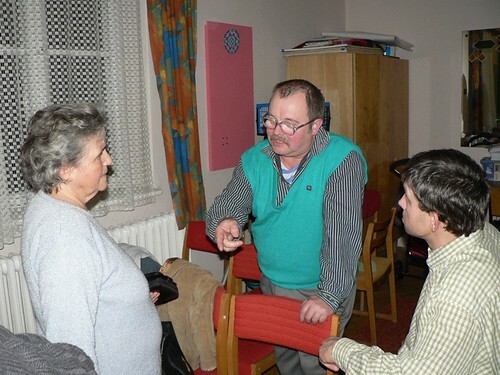 Above: After the Bible study, Miki had a chance to talk to Gábor and Hugi about their thoughts. Gábor shared how he feels that something is constantly missing in his heart. Something was missing that nothing seemed to fill in life. Miki had an opportunity to share about the only One who could fill that emptiness. As many of you know, Hugi decided to believe two weeks ago. It was joyful to see her after the first hour of English roaming around the room with a Bible in her hand waiting for the second hour of Englsh Bible study. 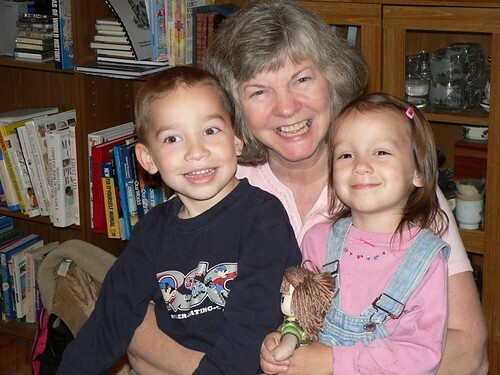 Please pray that her husband Gábor may also come to understand the gift of salvation and the majesty of Jesus Christ. Pray that Gábor would join Hugi in attending our church to hear more about what it means to follow Jesus by faith and experience Christian fellowship. After tonights outreach, Miki and I stayed after to mentor DezsÅ‘ in the area of leading small groups. 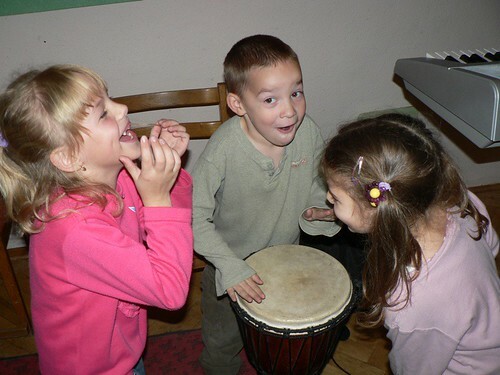 DezsÅ‘ will be leading Miki's small group for the first time this Thursday. We have also given DezsÅ‘ the responsibility to failitate our worship service this Sunday. 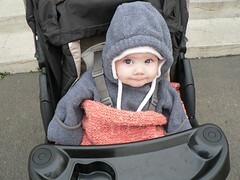 These are all first steps for him that we have been preparing him for through teaching and example. Please pray for DezsÅ‘ this week that He would be led by God's wisdom and be used by God to bless others through how he ministers. Above: This morning, we held our bi-monthly Family Day outreach. We were thankful for the above visitors sitting to the right of Heidi. Above: Andi and her son Milán (with rolled up paper) also enjoyed Family Day with us. Andi works in one of the two preschools in PetÅ‘fibánya, and attends our church. We are praying for her husband, that he would also be drawn to God. Would you pray for their family? Above: Julika telling the story of Ruth. Above: After hearing about Ruth, we broke into small groups-one for adults and one for kids. Our teammate Brenda prepared questions which facilitated great discussion. Two of the visitors, (mother and dauther above center) shared about how they came to visit this day. The mother works at the same place as Julika (our teammate), and after hearing over and over about the things Julika was involved in, she asked if she could come and see. I believe this day was more designed for her than for the kids. In our time of discussion, it was clear that she is being drawn to God. 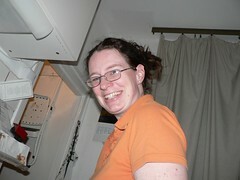 Julika will continue to have opportunity to reach out to her tomorrow at work. Please pray for her! Above: Andi returns later in the day to our worship service with her son Milán. 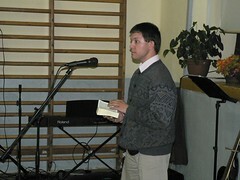 Above L: Péter preached tonight about the necessity of faith in Jesus, even when we face 'giants'. 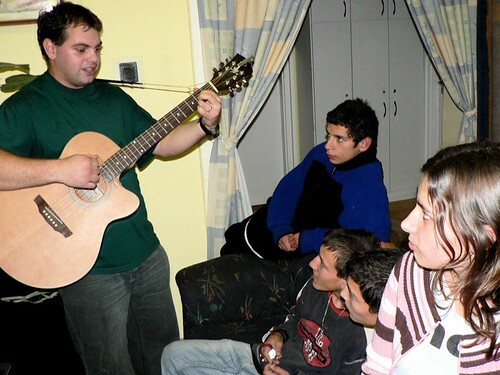 Above R: Péter also brought his nephew who gave his encouraging testimony about turning to Jesus after spending time in the world and finding it empty. 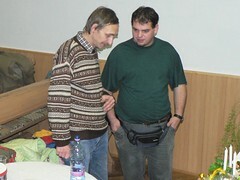 Péter is an elder in Miki's sending church: Budafoki Baptist. 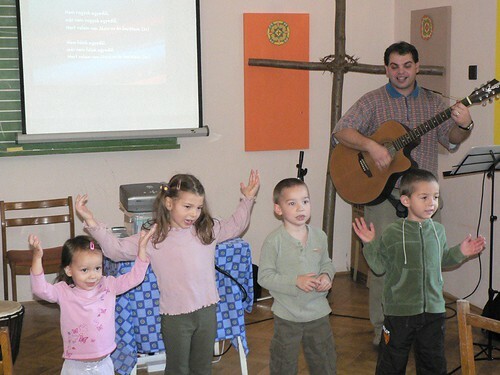 We are thankful for this Hungarian church's constant encouragement and support. Above: DezsÅ‘ also shared about what God has been teaching him through a time of testing. A few weeks ago, everything was going smoothly in his life, and he was growing in his faith. Just a few weeks ago a series of struggles and tough times have seemed to multiply. At one point in the week, DezsÅ‘ said he wondered what was going on. God led him to the conclusion that it is easy to talk about faith when everything is going well. But will we also cling to God and praise Him in the times that are tough? I am so thankful for these lessons being learned by DezsÅ‘ as we continue to train him for the challenging future role of leadership. Please continue to pray for him and his family in this time of testing. 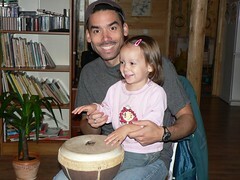 Above: Ben imitating daddy on the drums. Above: The first thing I saw tonight after returning home from the orphanage. Above: On Thursday night, we visited the orphanage in the neighboring town of Selyp. 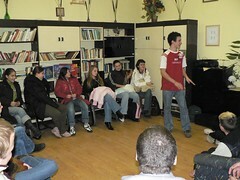 A large group of teens are gypsy and enjoy Miki's music. 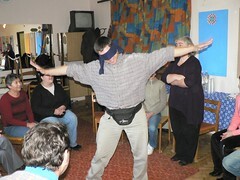 Above L: Dávid readying himself to act out the word 'swing set'. 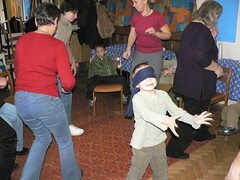 Above R: Janka trying to get them to guess 'Spider-man'. 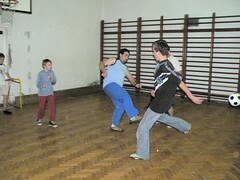 Above: Teenagers, Zoli and Gabi teaming up to act out the word 'slide'. As we continue to seek to be obedient to Jesus' command to make disciples, we are directing the teens into opportunities to serve using their giftings. We are so thankful for Dávid, Gabi and Zoli coming with us to minister to their peers. 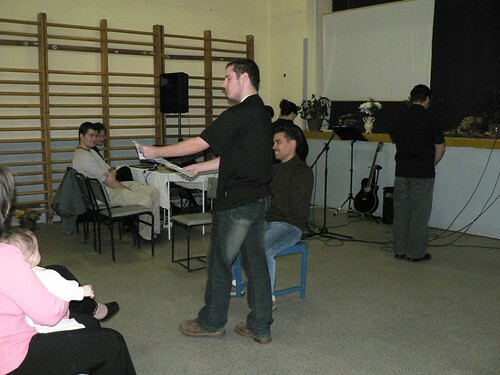 Above: Heidi and Miki performed a drama illustrating the need for us to put our hearts in God's hands. Above: Using the drama as a springboard into discussion. We praise God for the attentiveness of the kids and the participation in the discussion. We are also thankful for the teens who joined us in singing "Lord, I lift Your Name on High" before ending the evening. Above: Elimér bidding us fairwell. 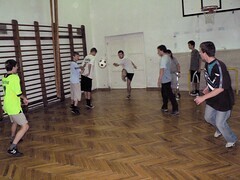 Above: On Friday we had over 25 teens come to our sports night outreach. The majority of these kids come from broken homes and tough backgrounds. With those who have attended for over a year, we have built a relationship of trust and respect. Others, however, who are new keep themselves at a distance relationally. The devotion time, which we hold at break time went better this week, but It is clear that there is a hard indifference toward God's love offered in Jesus Christ. Please pray that the seeds we are planting would bear fruit and that these teens would be drawn to God by his grace. 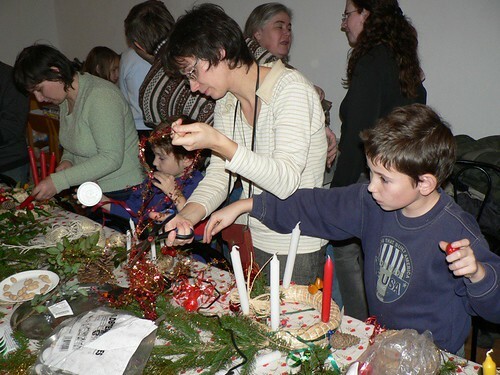 Above: Some of my students from L to R: Hajni and her son Attila, Gábor (Hugi's husband), Heidi and DezsÅ‘. Hajni's son knows Benjamin from pre-school and we sometimes see each other at the local playground. Gábor visited our program for the first time tonight. His wife Hugi was saved last night in church. 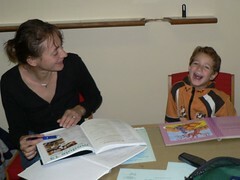 Gábor did not stay after for our second hour of Bible study, but he has decided to begin attending our English program. Please pray for Gábor. DezsÅ‘ did an excellent job translating for me in the Bible study. Tonight we talked about God the Father's response to repentance. 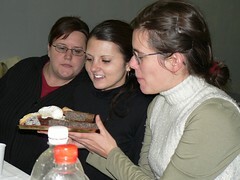 Above: Eszter and Monika (above center) are sisters who live in the town of Jóbágyi. They continue to stay after for our Bible studies, but also continue to be completely silent. Brenda, while driving them home, was able to talk to them about their opinion of the study. They said they enjoy it and that the teaching causes them to think about new things that they had not previously considered. Please continue to pray for Brenda as she seeks to build a relationship with them. 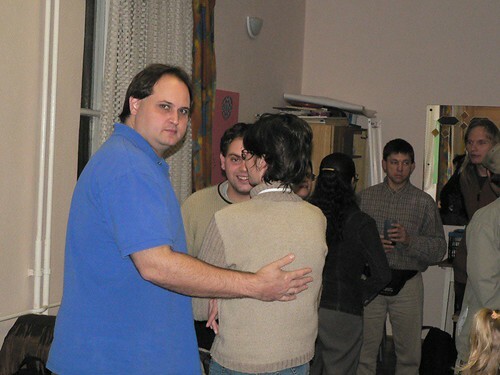 Although Hugi's husband Gábor left, Hugi stayed for the second hour of Bible study. Please pray for her in these first few days of new life in Christ, that she would be drawn to His word and be protected from the enemy. Above: Hugi received Jesus tonight as her Savior! Hugi, who has attended our English program for the last few semesters, came for the first time to our church service tonight. Hugi has been one of our English students who has consistently stayed for the second optional hour, where we hold our Bible study investigating the claims of Jesus Christ. Tonight, God was gracious to give her understanding of the gift of Jesus Christ! After service, Erika (Miki's wife) prayed with Hugi to receive Jesus Christ! Praise God for pouring out His grace upon her and blessing her with the gift of forgiveness of sins and eternal life through Jesus. Hugi plans to bring her husband to our English program tomorrow night. Please pray that her husband may also come to know Jesus! Above L: Ildiko sharing with Miki. Ildiko has been attending our church from day one. We are thankful for her faithfulness and also for introducing her family members to our fellowship. Both of her daughters, Eszter and Lidia are saved and also attend. 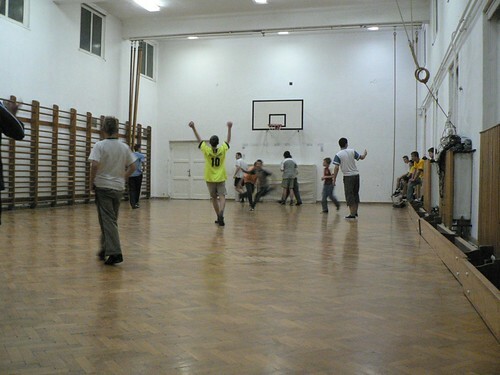 Above R: Teenagers, Gabi S., Samu, Ádám and Dávid. 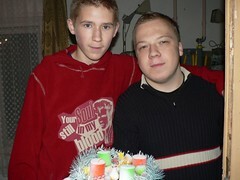 After disappearing for some time, Ádám and his friend Samu have attended church two weeks in a row. Sharon told me that Ádáms expression became quite contemplative when I began to explain the awesome exchange that took place on the cross. Please pray that he would continue to contemplate Jesus' awesome work of grace and rededicate his life to following Him. Tonight, our entire team came late to worship service. It was a bit comical to be greeted by church members rather than being the ones greeting. Why were we late? 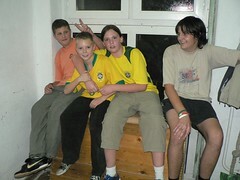 We had just returned from a mission's day and outreach in the town of Egerszolát (Hour and a half drive). 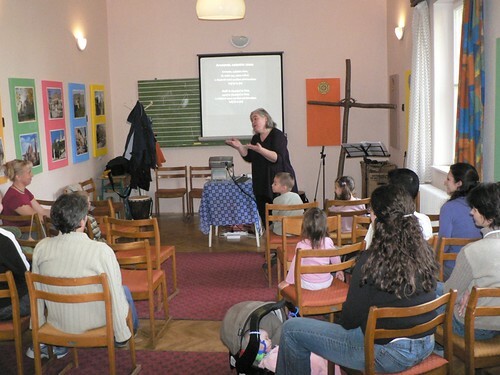 Above: János Papp (President of Missions of the Hungarian Baptist Church), giving an overview of the Baptist churches/churchplants throughout Hungary. A few weeks ago, Miki and I traveled to Egerszolát, to meet with János Papp and two other church planters. We discussed ways in which we could partner in our region, and strengthen each other's ministries. Today, we carried out our first steps of working together. Our team from PetÅ‘fibánya traveled to Egerszolát where we joined church planters from Gyöngyös, Pasztó, and Egerszolát for a community outreach. 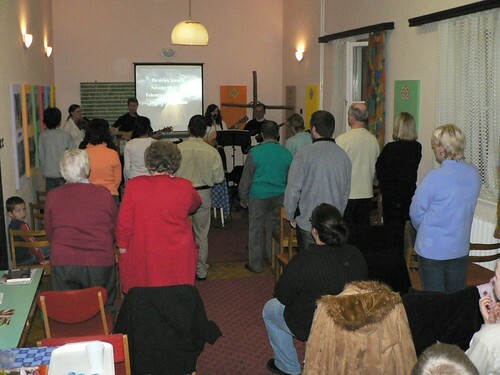 Before the outreach, we had a time of worship, prayer and various forums on different aspects of church planting. 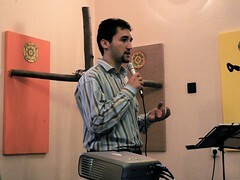 Above: Miki led a forum on evangelism and outreach to teenagers. Above: The church in Egerszolát treated us to a classic meat and potatoes (and cabbage) lunch. Afterwards, they loaded the tables up with delicious desserts-unfortunately, my stomach had reached full capacity and would have nothing to do with these goodies. 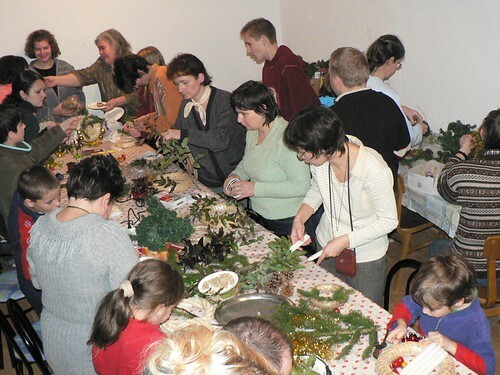 Above: We were thankful for many who came to the outreach in Egerszolát. Even the mayor came! Above: Csaba and Erika were able to share their testimonies. Above: Miki and Heidi presenting the "I" drama. Two people colliding with the conviction that life is all about "me" find that life is all about Jesus. 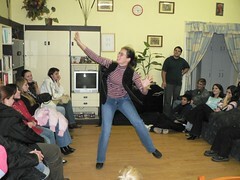 Above: I was proud of teenager Zoli, who came with us today and also served in our drama outreach in Egerszolát. 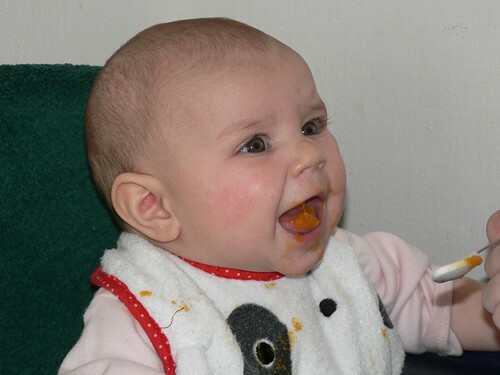 Above: Putting Kira's taste-buds into shock with pumpkin. 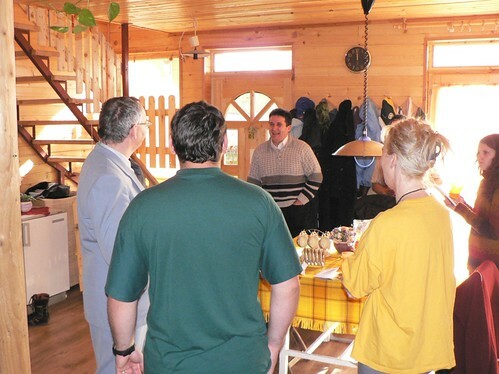 Above: This morning, at Miki's house, we had a meeting with leaders from the Baptist Church in Hungary. We gave them an update on the progress of the church being planted in PetÅ‘fibánya. Although we are relationally related and supported by two baptist churches in Hungary, our church is not 'officially' (legally) recognized as such. 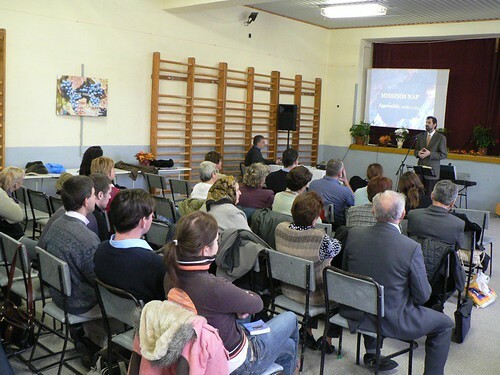 The meeting today is part of the process of being officially identified with the Baptist Church of Hungary. Above L: Ben taking the digital camera for a spin and getting some shots of mom. 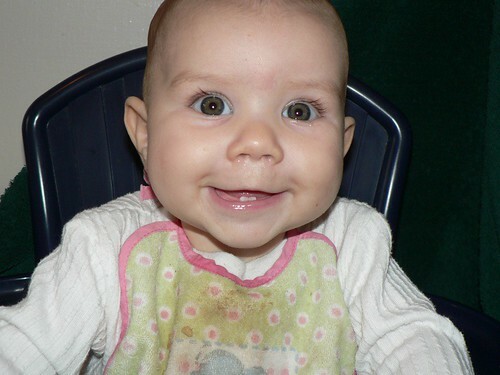 Above R: Chubby cheeks. 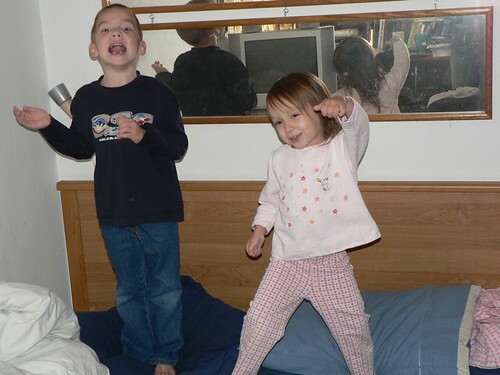 Above: Ben and Elianna getting 'siked-up' for a wrestling match with dad. Unfortunately, dad won again. Above: Our Friday night sports outreach. We had more kids come than ever tonight, possibly because of a mid term break in school. I can't say that more was a good thing, as it was very difficult to keep things 'in order'. In the time where I share the gospel, there were so many NEW kids that I felt like I was talking to the wall as the chatter, giggles and intentional attempts to distract increased. When I closed the devotion in prayer, I could only feel sorrow as the majority of the NEW kids just scoffed at His Word. However, I also sensed His great love for them and His desire for them to know truth. Please pray for these teens to seek the One who loves them. Our teammate Heidi had an opportunity to meet with one of her students, Jutka. Jutka is a teacher in PetÅ‘fibánya and has yet to stay after for our second hour of English Bible study on Mondays. Last Monday, Heidi was able to talk to Jutka and she shared how we are viewed as a sect because we are not Catholic and there is no church building. Tonight, Heidi was invited to meet with Jutka (at Jutka's house-a big deal!). Heidi discovered that Jutka knew church member DezsÅ‘ years ago, and has noticed the change in his life since he has become a Christian. 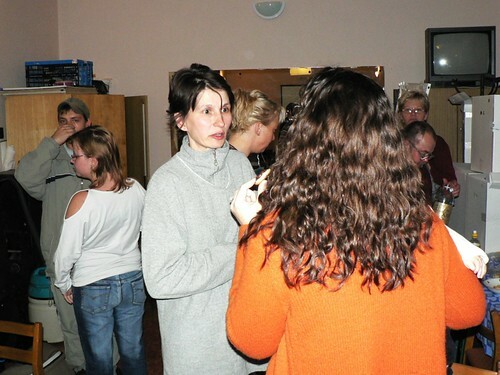 Jutka had nothing but good things to say about our English program, and our organization. 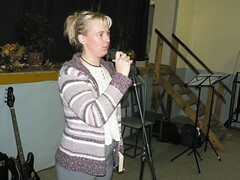 Please pray that the cultural concepts that keep Jutka from stepping into our church would be changed. Pray that Jutka would come to trust us as we follow Jesus and that she would come to put her faith in Him. Our teammate Brenda also had an opportunity to meet with some of her students from Jóbágyi (10 minute drive from PetÅ‘fibánya). 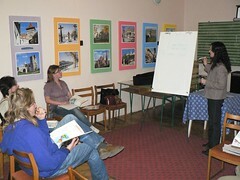 She was able to meet their family and give Monika a lesson on business English. Please pray for this relationship to deepen and for opportunity to share the gospel. Some of our other students like Feri, and Hugi have said that they would like to visit our church service on Sunday. Please pray that God would lead them to follow through on their desire to come this Sunday.